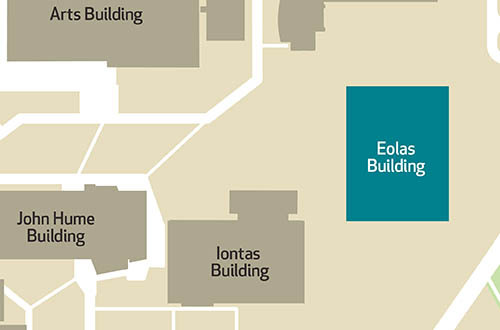 We are located in the Eolas Building on the North Campus of Maynooth University. When you enter the main entrance of the Eolas building, proceed down the corridor and the IT Services is located on the ground floor. IT Services provides a wide range of general and specialist IT services to students and staff of the university in support of the university’s objectives in areas including teaching, learning and research. Visiting IT Services, we are located in Eolas on the North Campus. Contacting our customer service staff (Computing Assistants) in any of our student computing locations. Attending clinics which we run periodically – especially for wireless connectivity issues. If you are a new student or new staff member, we particularly encourage you to visit our facilities and make direct contact with our support staff. Cuireann Seirbhísí TF réimse leathan de sheirbhísí ginearálta agus de shainsheirbhísí TF ar fáil do mhic agus do bhaill foirne na hOllscoile. Tacaíonn Seirbhísí TF leis an Ollscoil a cuspóirí i réimsí éagsúla a bhaint amach; cuspóirí taighde, foghlama agus teagaisc san áireamh. Tugann Seirbhísí TF aire don bhonneagar ríomhaireachta a bhuntacaíonn leis na seirbhísí sin. Tá tuilleadh eolais faoi na seirbhísí ar fáil ar an suíomh idirlín seo. Chuairt a thabhairt ar Sheirbhísí TF ar an gCampas. Theagmháil a dhéanamh lenár bhfoireann um sheirbhís do chustaiméirí (Cúntóirí Ríomhaireachta) i gceann dár láithreacha ríomhaireachta do mhic léinn fhreastail ar cheann de na clinicí a reáchtálaimid go tréimhsiúil – go háirithe má tá deacrachtaí agat a bhaineann leis an nascacht gan sreang. Más mac léinn nó ball foirne nua thú, molaimid duit cuairt a thabhairt ar ár saoráidí agus teagmháil dhíreach a dhéanamh lenár bhfoireann tacaíochta. We all create and use data in our work at the university. Data can take different forms including, but not limited to documents, spreadsheets, images, media files or presentations. Each user has a responsibility to maintain and protect the data s/he uses as a member of the University community. IT Services ran a competition for those who actively participated in the pilot and the winners were presented with a One4All gift voucher on the 5th of September in IT Services, Eolas.